Local officials across Texas are hearing from lawyers who want to help them sue pharmaceutical companies over the nation's deadly opioid crisis. Editor's note: This story has been updated with a statement from John Parker of the Healthcare Distribution Alliance. Bill Bilyeu started receiving the Powerpoint presentations in October. The administrator for Collin County, north of Dallas, found the slides interesting at first, with their charts, numbers and logos from law firms seeking to sue opioid manufacturers on the county’s behalf. But Bilyeu soon grew weary, finding that none of the pitches seemed tailored to the needs of his suburban county, which had 85 drug-related deaths in 2016. 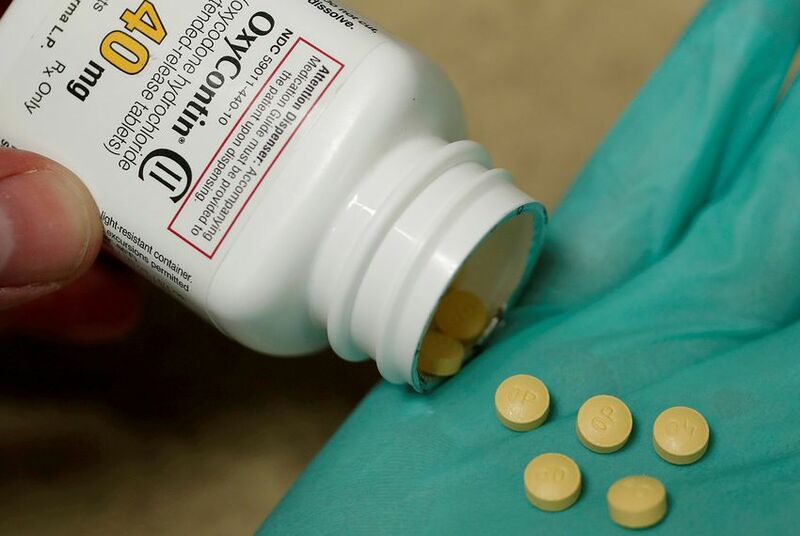 County and city governments across Texas have been the focus of a legal feeding frenzy as law firms vie to represent them in lawsuits against pharmaceutical companies over the nation’s deadly opioid crisis. The firms say the companies oversold the drugs' benefits for treating chronic pain and have downplayed the risk for addiction. There were more than 42,000 opioid overdoses in the United States in 2016, according to the Centers for Disease Control and Prevention. Deadly opioid culprits include prescription painkillers such as Hydrocodone; Oxycontin; fentanyl, a synthetic drug; and heroin. While there’s been focus on states like Kentucky, Maine, Ohio and West Virginia for the opioid crisis, 1,107 Texans died from opioids in 2016. Lawyers say they want to hold the companies accountable for that epidemic and help governments recoup the cost of combating and treating the opioid crisis in their areas. But the firms might also see the potential for a financial windfall similar to the $15 billion settlement the state won from suing tobacco companies in the 1990s. Currently, individual cases have been absorbed into one multi-district case under a federal judge in Ohio. The presentations show colorful charts and data from the CDC and the Substance Abuse and Mental Health Services Administration, and links to national media coverage of how opioids have impacted communities. Other documents show law firms pointing to examples of prior cases against some of the pharmaceutical manufacturers and distributors as evidence of success. The big selling point in all of them: Get pharma to pay for your troubles. Lawyers are enticing counties to sign on to try to recoup costs for health care, criminal justice, lost productivity and more. In October, Upshur County became the first county in the state to sue. The defendants named were a long list of big pharma players: Purdue Pharma, Endo Pharmaceuticals, Pfizer, Janssen Pharmaceuticals, Teva Pharmaceuticals, Allergan, AmerisourceBergen Corporation, Cardinal Health, McKesson Corporation, Abbott Laboratories and Johnson & Johnson. John Parker, the senior vice president of the Healthcare Distribution Alliance, a national trade association representing drug distributors, said in an emailed statement that the opioid crisis is a "complex public health challenge." Matt Daniel, a partner with Ferrer, Poirot & Wansbrough in Dallas and co-counsel for some of the counties considering lawsuits, said the competition for clients is stiff and that convincing county officials to hire them is no easy task. He is partners in the case with Matt McCarley of the Dallas firm Fears Nachawati, and another firm in Maryland. Daniel said he tells officials that pharmaceutical manufacturers and distributors are to blame for the crisis and that taxpayers have had to shoulder the costs of paying for people living with addiction. He also makes sure officials know they won't have to spend anything. Some county officials have responded that “we’re not really the suing people.” Officials have also asked whether Daniel’s firm can handle this kind of litigation and — in moments of honesty — whether the cases would hurt or help in upcoming elections. So far, Daniel has been hired by Rockwall, Brazos, Stephens, and Kaufman counties. But in conservative Texas, not everyone is on board. Attorney General Ken Paxton is leading Texas into a 41-state investigation of companies that manufacture or sell opioids. Last fall, the states served investigative subpoenas or other requests to eight such companies and their affiliates, including some named in Upshur County’s lawsuit. During a press conference last week with U.S. Attorney General Jeff Sessions about the opioid crisis, Paxton vowed to continue working on the issue. Bilyeu said between 10 and 15 firms reached out to him, but the Collin County commissioners have said they don’t plan on suing. For Howard County Judge Kathryn Wiseman, despite all of the lawyer requests to get on the county commission’s agenda to speak about representing them in opioid litigation, she’s not convinced about why they would participate. She’s also wary of the potential time constraints involved.